We really do consider it an honor to be on this journey with so many of you. It’s also been a privilege for us to get to know some of you as you’ve shared your family’s story with us. A friend from Down Under. One of the things we really like to do as often as possible is take things from online, to offline. We love getting to meet and build friendships with families in real life. (Besides, it’s really hard to hug someone online. And sometimes people just need a hug.) We get the opportunity to connect with people all over the world, and meeting for a play date isn’t always an option when you someone live across an ocean. So we do the next best thing; video chat! We first met Libby and her wonderful family through our Facebook page. 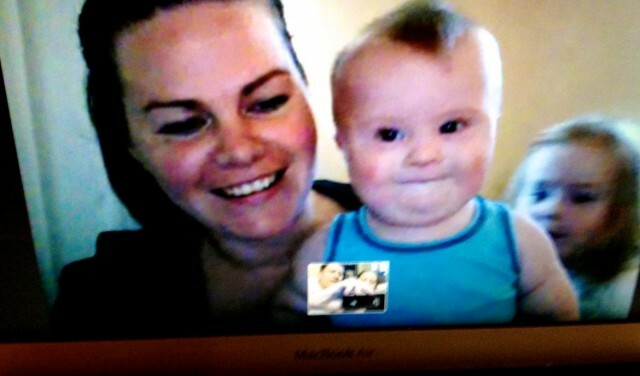 And we’ve had the awesome privilege of getting to them even better during our numerous Skype video-chats. Isn’t technology awesome?! A milestone of chocolate proportions! In case you didn’t already know this, Australia has theseamazing chocolate snacks called Tim Tams. And would you believe that our new friends from Australia offered to send us some! Hello, can you say awesome! 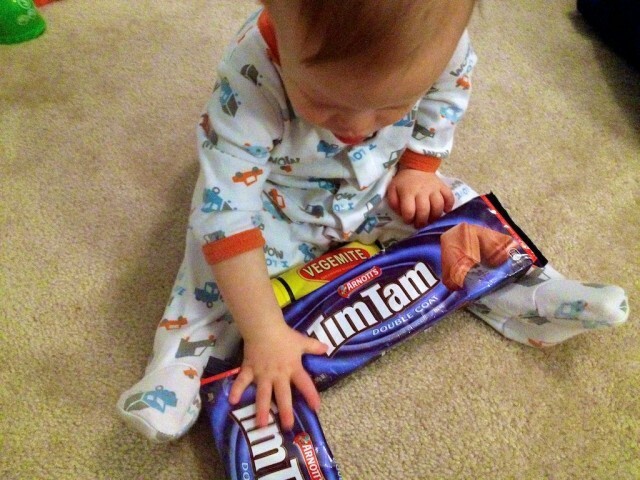 …it’s his first Tim Tam! To say he enjoyed it would be an understatement. When I posted about Noah’s first trip to In-N-Out Burger we received a few messages from some bothered grumpy rude quick-to-judge un-fun considerate people who took the time to tell us in a very rude un-lovingjudging grumpy snarky direct way that they were concerned about Noah’s diet and our parenting skills. I see absolutely no reason to be concerned…. Just in case anyone reading this is a chocolate hater, and perhaps also concerned for Noah’s diet, and perhaps already have their fingers on the keyboard ready to fire off an email to me about how bad chocolate is for kids, or how by giving Noah this Tim Tam we’re allowing him to become another statistic of the national obesity epidemic, or that we’re irresponsible parents (yes, someone actually wrote in and told us that.) Or that we’re just trying to plump our kid up early so he can be on The Biggest Looser some day. 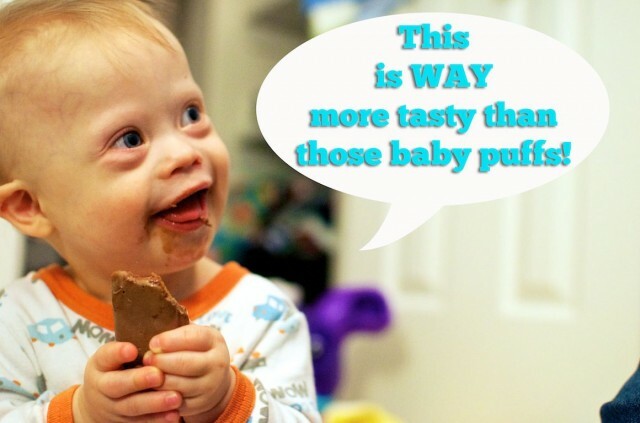 Or that kids shouldn’t eat chocolate because Jenny McCarthy thinks chocolate causes kid’s ears to fall off. Before you do that, let me set your mind your ease. One of our favorite words is balance. Almost everything in life is unhealthy if done in excess (just ask my mom about the time I tried to eat that entire bag of grapes…,my stomach hurts just thinking about it.) So unless you’re allergic to it, chocolate, in moderation, isn’t bad for you. I’ve meet a lot of parents who are anti-this, or anti-that. You know the type. The ones who are known by everyone for what they’re against, rather than what they’re for. Fun Isn’t A Curse Word. Strive to have balance in your life and family. Some parents are wound so tightly they’ve forgotten what it’s like to have fun. They run their home like a mini-boot camp. Their kids are so worried about what will happen to them if they get Play-Doh on the carpet or a crayon mark on their clothes, that they lose their sense of wonder, curiosity, and creativity. I’m not saying it’s wrong to have convictions. Or structure. Or rules. In fact, we need those things in our homes and culture now more than ever. I’m just reminding you to remember to laugh. To have fun. To enjoy parenting again. You only get one shot at it and it’s over. So take advantage of it. And if you’re one of those parents, I want to encourage you to stop worrying (and gossiping) so much about which parents in your neighborhood allow their kids to watch tv, or eat happy meals, or…..go to In-N-Out Burger, and instead redirect that energy and passion into creating memories with your family. I think you’ll find it much more rewarding. Now I hope you’ll excuse me, I’m off to search Pinterest in hopes of finding some fun Halloween costume ideas. Here’s to hoping we get more candy this year, than last! Big thanks to Libby and the family for their amazing friendship, and for sending us these delicious treats! We’ll be sending you some Pop Tarts soon! I’ve got a question for you…. Speaking of fun, what’s the last thing you’ve done that caused your kids to laugh. What’s the last “fun thing” you’ve done. Together. As a family? Leave a comment and tell us about it. Yay! So cute and looks like he is having so much fun :)) I gave my kid froyo in Hawaii but i figured hey it was at the pineapple plantation ! Lol! Why not?! My late mother in law always believed that the dust will be there after you die, so if there is a moment or time to spend with your family do it! Another one of her great sayings (she borrowed) Make each day your masterpiece. (John Wooden). You are SO right about the importance of enjoying quality time with your kids/family. I used to go nuts over the house being messy. Now, it might be clean once a week (for about 3 minutes! ), but my kids are happy and they are loved. And we laugh all the time! Hugs to Noah! 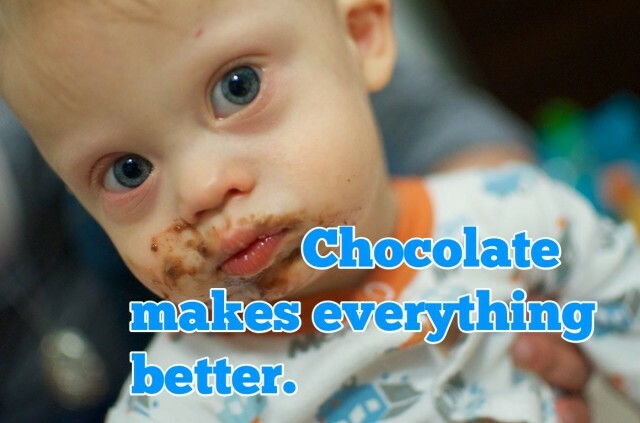 These photos of Noah were awesome, and I love the chocolate dribbling from his mouth. So happy and joyous looking. 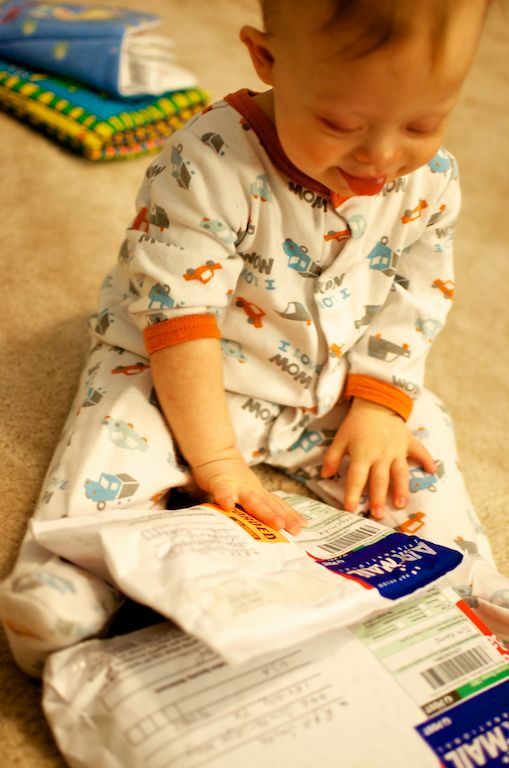 It reminds me of our little one, Ryder, who looked about that way on his Birthday with his cake and stuff. Such wonderful fun he and his baby brother who was one the fourth of July, while Ryder had turned three a few days before. Eyes just sparkled as did Noah’s. I just happen to read your blog while researching on crawling, and read your article on crawling vs creeping. (Really who knows creeping is actually the correct word for it) . I love your post and your parenting skills, you are so right about not to be a “for they are against ” kind of parents. I can see myself turning into one. 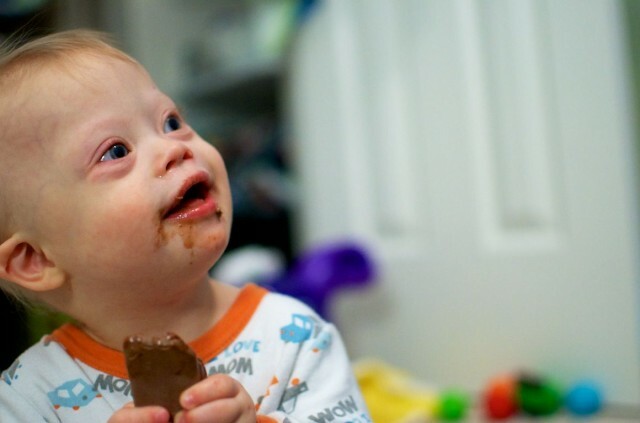 My eyes were filled with tears when I read your story, I don’t have a child with down syndrome, but a baby born with a nasty tumor. I still remember the day the doctor broke the news to us in ICU. I had a smooth pregnancy like your wife, everything was just unexpected. Thanks for teaching me to enjoy parenting. Hope to read more updates on Noah. God bless your family .